From the dazzling tutus and glittering tiaras of the big ballet classics to the modernised works of flesh-coloured leotards and soft ballet shoes, the popularity of dance appears to be increasing rapidly. Arguably as a result of the viral nature of social media and the innovative experimentation that is taking place in studios all over the world, the dance world and its audience are privy to fantastic creations and experiences which provide for their expectations. Despite the modernisation that ballet is undergoing, for example as a result of Wayne McGregor of Random Dance’s instatement as Resident Choreographer of The Royal Ballet in 2006, it is clear that the classics of the ballet world are also able to satisfy the hungers of audiences. McGregor’s influence over twenty-first century dance is undeniable, and whilst his work is technically outstanding and completely compelling, the repertoire of the Royal is also made up of works that have resided there for centuries. Classics such as Swan Lake, The Sleeping Beauty and The Nutcracker are three of a number of well-known and loved productions which are presumed to stay within ballet repertoire for years to come. Classical ballet was once seen as a high culture, rather than a popular one, yet this is also changing. The Royal Ballet LIVE was screened online in 2012, providing 200,000 dance-lovers and non-dance fans alike with the opportunity to take a peek into the working lives of professional ballet dancers. The iconic film production Black Swan starring Natalie Portman also took the ballet world by storm, depicting a violent and manipulative ballet environment, but ultimately extending ballet’s reach to wider audiences, increasing its popularity. The London 2012 Olympic Games also demonstrated a cultural shift, with ballet proving to be an influence in more than one area. Team GB swimmer Liam Tancock revealed that regular ballet classes were included in his cross-training, and Birmingham Royal Ballet’s principal Matthew Lawrence created a routine for the five times British champion gymnast Frankie Jones for the Rhythmic Gymnastics British Championships ahead of the Games. Dance is clearly demonstrated to appeal to and provide for a wide audience reach. 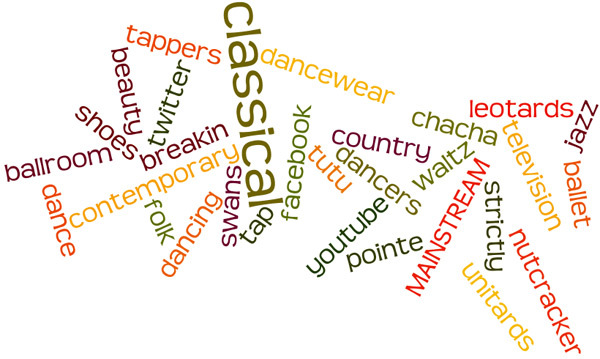 Dance has also been able to reach audiences through social media, making it ultimately accessible. Facebook, Twitter, YouTube, and various other platforms are able to translate the art of performance and reception to many who may not have the opportunity to access dance originally. For example, many dance companies have Twitter accounts clocking up thousands of followers, who are able to connect with and access a valued insight into the life of the company, rehearsals and classes – even the founder of Twitter is a ballet fan! Next Next post: Billy Elliot the Musical is Auditioning!